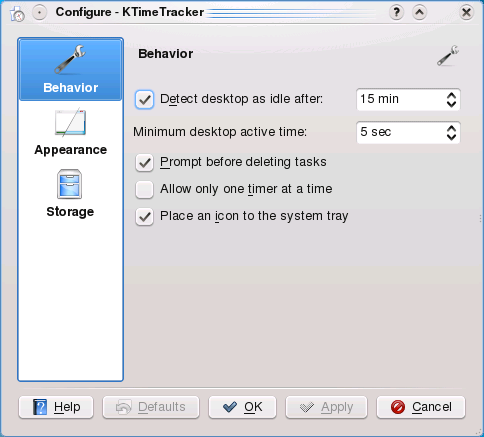 KTimeTracker is the todo management and time tracking component of Kontact, the integrated Personal Information Manager from KDE. KTimeTracker seems to be unmaintained at least since 2013. This is the one-and-only KTimeTracker manual. And everyone can edit it. KTimeTracker tracks time spent on various tasks. You are a software consultant with several customers and many project assignments. When billing your customers, you are required to report how much time you spend on what task. Use KTimeTracker to hold a list of projects and tasks. Whenever you switch your activity, double-click on the respective task and see how its time gets tracked. At the end of the day (or month) you can obtain a journal how much time you spent on what task. KTimeTracker allows you to organize your work like a todo-list. You can group your work by tasks and subtask. Every subtask can still have a subtask below it, up to some 1000 levels. Whenever you start working on a new task, just double-click the corresponding task in your todo-list. You will see a clock appearing next to this task indicating its time is now recorded. When going for lunch, it may happen that you forget to stop timetracking before. No problem: the idle time detector in KTimeTracker will pop up after a configurable amount of time giving you the possibility to revert (as if you said, "I was not working during this time.") or continue timing (as if you said "I was working during this time."). Configuration for PDA: Removes the search-bar to gain screen real estate. Assumes a touch-screen and pops up a context menu on every mouse click, even with the left button. Because of the iCal file format, KTimeTracker is compatible with korganizer. You can even work synchroneously on one file with korganizer and KTimeTracker. If one program changes the file, the updates will be propagated to the other application automatically. 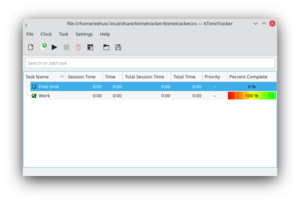 KTimeTracker scales well and it regularly tested with a 1.2 MB file (download it) available from (KDE Bug report 110523). A KTimeTracker benchmark is available from here. As you explore KTimeTracker you'll find questions that need answering. Chat with us, the KDE users, on IRC, the KDE users' channel. This page was last modified on 13 June 2018, at 19:41. Content is available under Creative Commons License SA 4.0 unless otherwise noted.